This Bud’s not for you. Bud Selig, a most mediocre commissioner—doubling for a spell as an owner—of Major League Baseball (MLB), will step down in early 2015. By meting out a devastating if circumscribed series of suspensions for PED use, especially to Alex Rodriguez (August 5, 2013), Selig is attempting to leave a legacy for cleaning up the sport. Rodriguez surely is no Boy Scout. But does his behavior merit a suspension three or four times longer in duration than the next-closest player? Scapegoating in the name of establishing a lasting image of toughness won’t work. 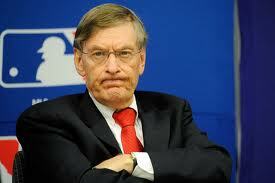 Whatever one thinks of Selig, the identity of his successor is top secret. I (Evander) will float a few nominees of my own. My first choice is Bill White. The negatives loom large: age (he will be eighty in 2014, same as Selig), a not-always-diplomatic temperament, and a likely unwillingness to accept the job if offered. To be the first African-American to hold the highest post in baseball, however, would crown an amazing career: player, broadcaster, league president, author. A more likely choice and another former player with roots in the Players Association is Joe Torre. Following his days as a catcher and third baseman, Torre became an unsuccessful manager, a fine broadcaster, a successful manager, and an executive of MLB. Torre is younger than White, but not in the prime of his post-playing career. What about another Joe—Girardi? Like Torre, Girardi was a catcher. He was a player rep and trained as an engineer with his mathematical mind. Girardi has won Manager of the Year kudos and knows how to liaise among players and officials. A dark-horse candidate for the position had a much larger one earlier in life. George W. Bush had been co-owner of the Texas Rangers and has expressed interest in returning to baseball. This entry was posted in Baseball, Right Off the Bat Website and tagged Alex Rodriguez, Bill White, Bud Selig, Joe Girardi, Joe Torre, Major League Baseball, Major League Baseball Players Association, Steroids, Texas Rangers. Bookmark the permalink.